Since 1993, IGC has provided affordable turn-key greenhouse solutions for growers of all sizes, schools, government agencies and retail garden centers. As a family business, we offer a level of personalized attention unmatched by large greenhouse manufacturers focused on landing the next big project. Whether your needs are a few hundred square feet or many thousands of square feet our expert sales staff will give your project the time and attention it deserves. Trust your next project to the people who know greenhouses. There can be a lot involved in a commercial greenhouse project, but that shouldn’t be your problem. IGC helps you every step of the way, so you can put less time into managing a construction project and more time into the day-to-day of running your greenhouse – the way it should be. 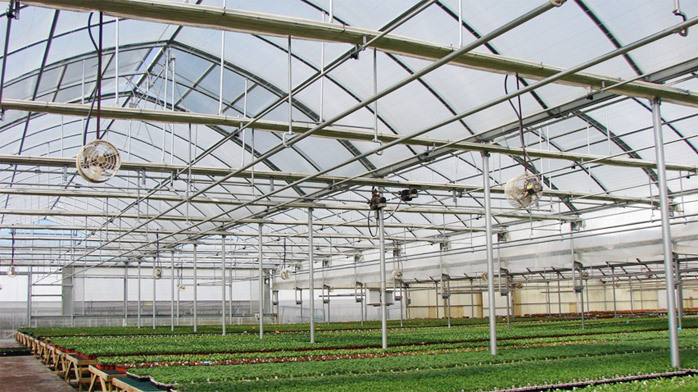 We start by helping you configure your commercial greenhouse structure. Since we are not a manufacturer, we have the freedom to recommend a structure that will best meet your needs instead of trying to move inventory. Based on your needs, we will recommend a frame type, size, covering, and equipment configuration that helps you meet the goals you set for your project. Once the details have been worked out, we will provide you with a detailed quotation that lists every component to be included in your project, line-by-line. If necessary, our engineers can provide wet-stamped engineered drawings for any state or jurisdiction in the U.S. We can also provide a detailed equipment schedule to take to your local building authorities and/or zoning board. With many commercial greenhouses, this step is absolutely essential since many projects require permits for one or more steps of your project. This permitting process can sometimes be a nightmare, which is why we shoulder much of that burden and leave you completely free to worry about more important things. IGC works closely with several private contracting firms that have years of construction experience with our buildings. Don’t waste time and money hiring a crew that is inexperienced with the specifics of building our commercial greenhouse structures, or in securing unreliable volunteer labor. Our turnkey construction services offer a single source solution for your project that that eliminates the “blame game” which often occurs between material providers and the builder. IGC construction services are so quick, so painless, that most owners will say they were a “must” for completing the project. Many of our customers choose to have IGC conduct a walk-through and training session to educate them about the capabilities and function of their new commercial greenhouse. Every member of our Sales Team has direct, personal experience in all facets of commercial greenhouse construction and operation. Don’t skip a beat trying to figure out how to properly configure the equipment in your new greenhouse. Get started right away! Speak with your Sales Representative about setting up an informative training session after your project is complete. IGC owns and operates the popular Greenhouse Megastore online store, and carries a complete line of greenhouse supplies to keep your new commercial greenhouse stocked and fully operational. Containers, equipment, soil…we have it all over at GreenhouseMegastore.com. And as always, feel free to call your Sales Representative at 1-888-281-9337 to place your supply orders.